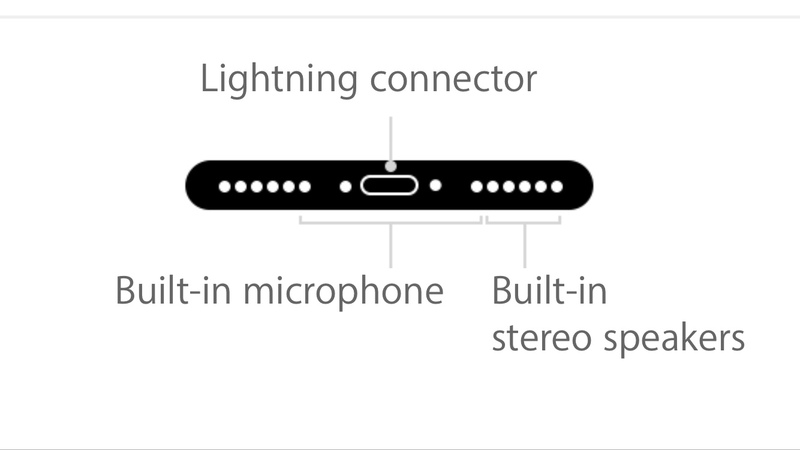 From Apple’s official specs the bottom side holds two grills in addition to the Lightning port. Apple shows that the right grill holds built-in stereo speakers and a built-in microphone. The left grill only holds a built-in microphone. This suggests that only the right grill has speakers and that there are two microphones (one in each grill). This is somewhat confusing, because it means the left grill only exists for cosmetic purposes. Also, why would they put microphone and speaker so close? Are my assumptions true? Is there only one microphone or two? Are there also speakers in the left grill, or only in the right? Two of them are located on the bottom, on either side of the Lightning port. The one near the old headphone jack has been there since the original iPhone, but iPhone 6s added another by the speaker grille as well. One is located on the back, between the True Tone flash and iSight camera. This microphone was added in the iPhone 5. You can check out photos of iPhones prior to the 5, and it is not there. The last one is located inside in the earpiece. This microphone was also introduced in the iPhone 5, to perform noise cancellation on the voice coming in during calls. Phil Schiller mentioned both #2 and #3 during the iPhone 5 keynote. All 4 microphones are used for active noise cancellation (reducing ambient sounds) and beamforming (detecting the location of the sound source), with one being picked as the most appropriate for recording (depending on closeness to the sound source, and on clarity). For instance, while shooting video, the rear microphone would usually be picked. Since iOS 10, you can record videos in stereo, so two microphones are picked in those cases. Do note that all 4 microphones are always listening for “Hey Siri” functionality. You can test this simply by holding up any of the microphones to your mouth and whispering “Hey Siri.” No matter which microphone you whisper into, Siri will trigger. Whisper away from them, and Siri won’t come up. iOS picks the best microphone at any given time. Finally, the microphone located by the speaker grille may be used to cancel out noise from the speakers while sound is playing, just as the one inside the earpiece does for voice coming in (and now also for sound playing on an iPhone 7). And of course, sound isn’t constantly playing through your speaker, so in most instances it can simply be used for regular noise cancellation and beamforming. iPhone 6s, 6s+, 7 and 7+ have 4 microphones. iPhone 5, 5c, 5s, SE, 6 and 6+ have 3 microphones. iPhone 4 and 4s have 2 microphones. All older iPhones include a single microphone. PS: On iPhone 4 and 4s, the second microphone is also located at the top rather than by the rear-facing camera. iPhone 6s also included the microphone in the first bore of the right speaker grill (unlike iPhone 6). It's probably a noise cancellation feature and will have the same function in iPhone 7. Your comment on oscillation problems are valid, and it's highly unlikely that Apple would use a mic so close to the speaker if it would include any function other than some error sampling / noise cancellation. Not the answer you're looking for? Browse other questions tagged iphone audio microphone speakers . How does (stereo) sound work with Thunderbolt displays?